Ok already….. here they are! Just for Jodi and Veronica and Erin and Bettina and Priscilla and all the other girls that need to see my shoes. The shoes I rave on and on about. The first thing I thought of when I broke my toe. Today was the first day in heels since then. My toe is killing me. But aren’t these gorgeous boots so worth it? I had a little old lady stop me today to comment on them. I have to hide from the weird guys at work or they follow me around when I wear them. 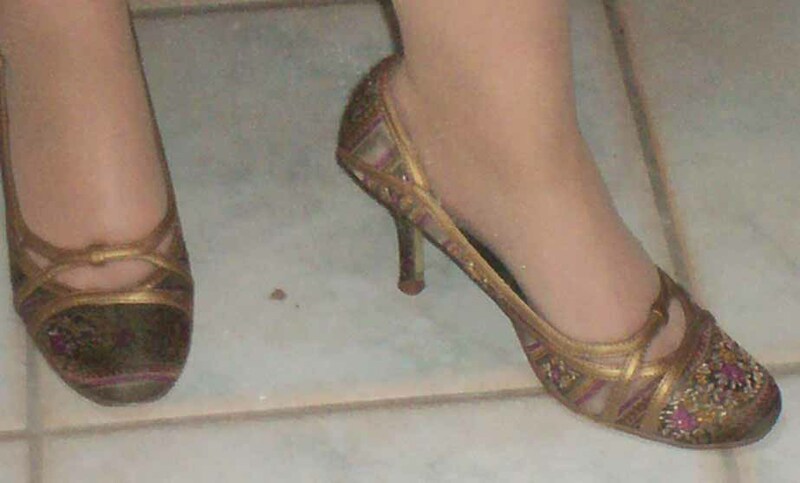 They are so pretty and detailed (look at the heel! The pattern is on the heel!) They just make me smile. These are the shoes I wear after a hard night with Boo or when I am having a I-am-the-ugliest-woman-on-earth day. I just look down and smile. Here are a selection of other fav’s for this season. Probably what she spends on weed for her kids. Pink and brown: these are the shoes that started it all. So there you have it. A small selection of the shoes I have worn over the last few weeks. The black boots are in my 100 things post at the top of the blog. Ooooh shoes, lovely shoes, I am totally inlove with the boots, and the black billy ones. I really like the others two, but not sure they would look good on me (damn father giving me his foot genes, why couldnt i have nice small girly feet??). 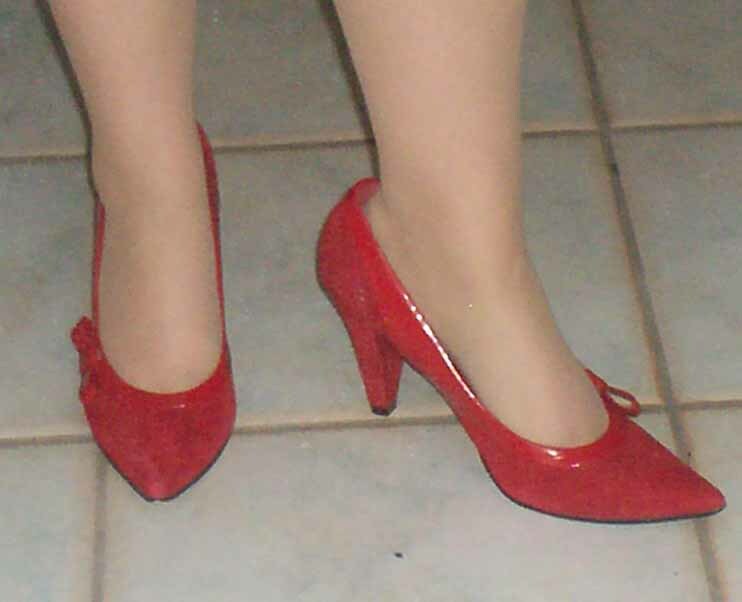 Please Please Please Kel post some more shoe pics and put names with them, ie i am still waiting to work out what kitten heels are and too scared to actually ask anyone in a real shoe shop especially when i only have dirty sneakers or uggh boots to wear in there (oh and nursing shoes lol). Hehe poor fat feral (that unfortunately describes me atm, no wonder the sydney girls didnt have to ask who i was last week, they all knew just at a glance) with the uggh boots, i can imagine that being me with surprised or confused look, because i have no idea about shoe brands or names other than Uggh is a “trademark name” that almost put australian businesses out of business and that Doc Martins make purple velvet shoes that i want. Oh and Saucony is the best sneaker brand for my ankles. 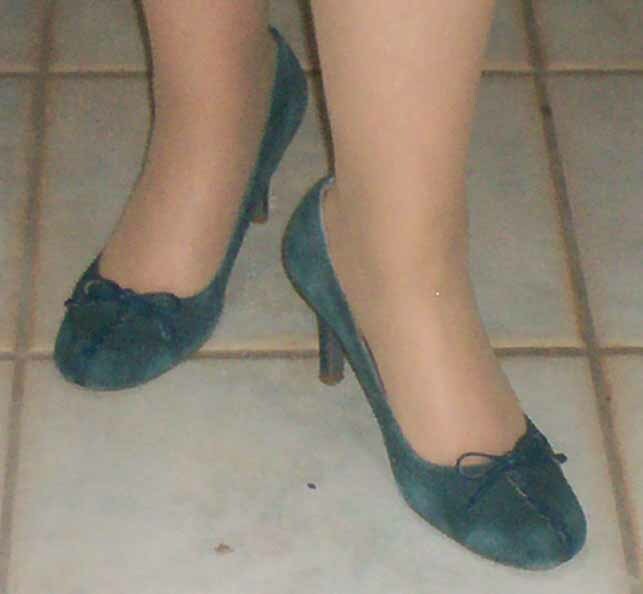 Oh and the green ones sort of look like the ballet flats but classier (i like them too). I’m so not a shoe girl. I’m good with a pair of sandals, a pair of crocs and a pair of dress shoes. I’m like a 13 year old that way. The problem is that I have huge feet and I can only shop in the secret transvestite area of shoe stores. Transvestites tend to like 4 inch heels and lots of glitter. Me, not so much. What shoe size are you??? I want your shoes! I love the Billy ones & also the last strappy ones. And your happy shoes are ones I would never try but now I have seen them on feet I want them too. Sigh, I have one pair of black shoes that i love that desperately need polishing that I wear to work everyday. I have a pair of flat skip ons & a paid of pink laceups & joggers. And that is all I wear regularly. My very high fancy shoes are not ones I can wear to work & I have one pair that are too high to wear comfortably & made my nail bleed as I was gripping onto them so hard. I am all jealous. I only have a few pairs of shoes and my sandshoes recently fell apart. Oh I love ALL OF THEM!! I have a bit of a shoe fetish, but it’s sooo hot here all my shoes are strappy, and my dog seems to have a fetish too. They are all gorgeous. I love them all. I could ooohh and aahhh about them all individually but then you would run out of room for the rest of your blog LOL. And remember, while trying to build up your shoe collection, shop by phone :). I lurrrrvvee my local shoe shop. And if I give them enough notice they get the right size in for me if they haven’t got it when I ring. Yes ma’am, we definitely need to go shoe shopping together. I wouldn’t have a hope!!! 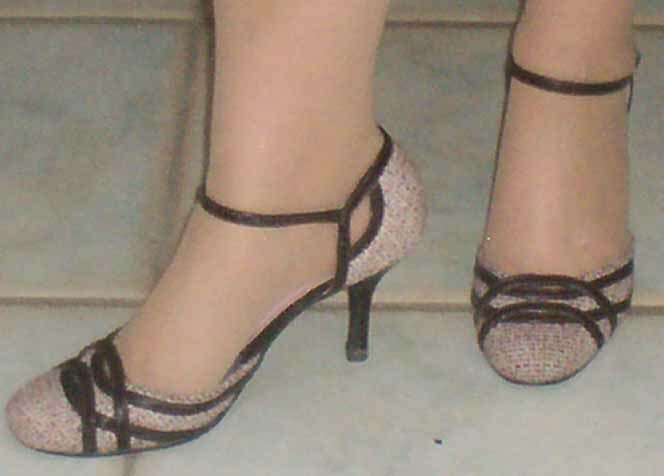 Since kids I don’t tend to wear much with heels which is a bummer as heels make me look taller and therefore thinner. But then, I don’t have a “real job” to go to either. ooooooo I LOVE your boots most of all! lol Wish I had the balance to wear heels. sigh. They are nice. To look at. Loved the green ones and the patterny goldy ones. But high heels are so uncomfortable! And they are even less comfy if you need orthotics, as I do! How DO you manage to wear them? You shock me with your rude remarks about uggies. In response, I shall tell you that I’ve never ever heard of Billy shoes before. So there! MMMMMMM…. All very nice… I think I need to add some colour to my shoes after seeing all your pretty ones. All black ones, might not cut it any more. Ooh very nice. Like the boots, love the red ones and the pink and brown, and am planning on stealing the happy shoes. Just so you know. I love love love your happy shoes! Love your happy shoes and the pink ones with the black bits …. all of them realy but those two are my favourite. Previous post: I’m in ur blog deleting ur widgets…. Next post: Apologies to my internet lovelies.